Placing Richard Butchins masterful The Voice of the Unicorn in the same space amongst a whole tranche of five disparate exhibitions took the art of the non-curation of shows at the Southbank’s Unlimited Festival to a new level. The poignancy of The Voice of the Unicorn as a subtle expression of the difficulties in navigating a world experienced as an overload of sensory confusion – were placed in a space ricocheting with the distraction of general sound from the building and the colour of the artworks of other artists displaying in the same space. 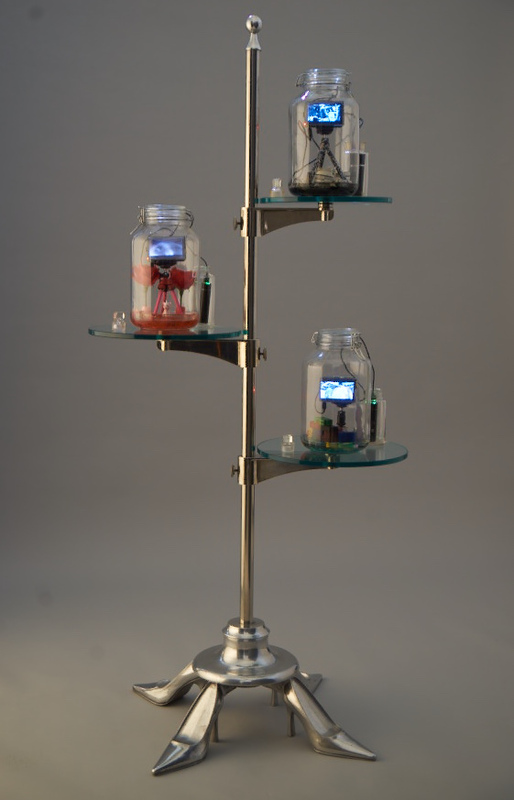 Made of a cacophony of screens – several framed on easels in the form of video paintings – screens of all sizes, some rendered within a tree of glass jars amongst collections of associated objects, the arrangement of screens appeared subordinate to the function of the space as a thoroughfare leading to the Blue, White and Yellow Rooms within the complex. In one way you could say that it was a perfect setting for an installation that illustrates just how confusing the world can be – especially for individuals on the autistic spectrum. I recall going to an interview at art college and showing slides of my paintings that had been photographed with the edges of the canvas and the space outside the frame, showing. And the interviewer stated that he was more interested in the fragments of spaces outside of the image that remained in the photograph. Here in the Spirit Level I felt compelled to understand Butchins projection of sensory overload – the function of his exhibit as an investigation into perception, silence and the reality of the mind – within a broader framework of the difficulties in designing architecture intended for large numbers of human beings in motion. 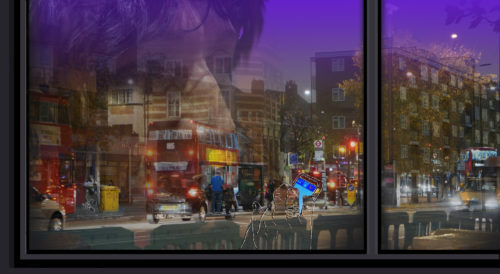 The persistent busyness of the Southbank Centre gave this concept of how brain functions fragment under stress – an added layer of meaning. The Voice of the Unicorn brings alive the story of Butchins visit to Osaka and his artistic journey both within the city, but also through his career as a film-maker. 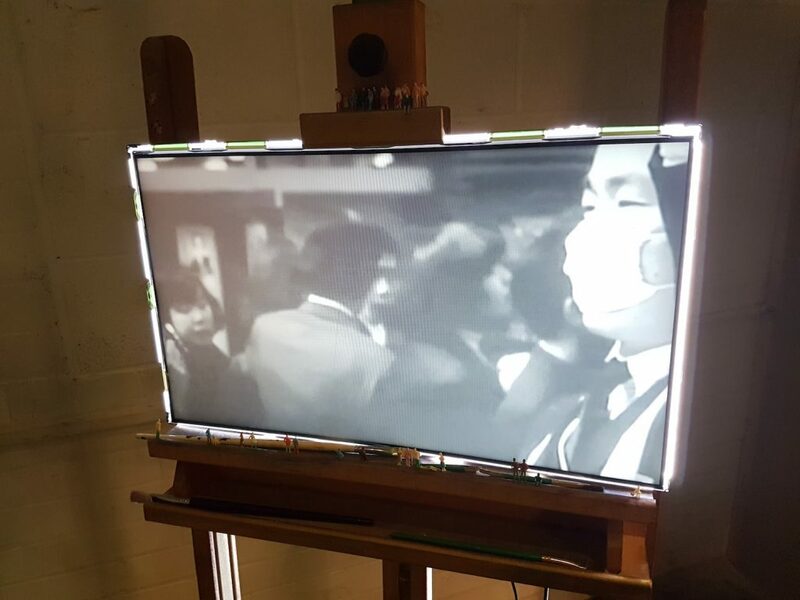 The installation is shot through with short sequences from 4 films from Japanese New Wave cinema in the 1960s and early 70s that give expression to Butchins aspirations as an artist. Butchins describes a personal narrative in which he went to Osaka to work with the dancer Kazuo Morita. She introduced him to the Atelier Corner artists Yasuyuki Ueno, Mami Yoshikawa and Koji Nishioka. He fell in love with their work and with the studio space. The resulting dance created by Morita seen in repeated sequences on one of the screens, becomes an expression in movement evoking the act of drawing. Wearing a white flowing dress, the dancer is the living embodiment of the blank page or canvas, herself representing the movement of a pencil or a paint brush. I loved the close-ups and detail of the artists – one moment engaged in eating a bowl of noodles before contemplating making marks on a canvas – and the implication that the two acts are as essential as each other in giving expression to the artists’ life. We see fragments of the city moving, distorted, turning in a way that mirrors real-life – snatching fragments of architecture, brief expressions, a masked face. We see Butchins himself navigating the streets, driving, talking. Largely without words, he gives a glimpse into the lives of this group of artists in Osaka – some of the same artists who in partnership with Outside In – brought their work to the Southbank Centre in 2016 in an exhibition called Nama Āto. We witness the calmness and tranquility of the artist studio; the absorption of the artists in the act of creation: all in contradiction to the sense of being overwhelmed by everything around, both within the screens and within the physical space of the Spirit Level. Intentionally the narrative is broken and fractured. The film-maker has brought his own sense of difficulty in making sense of the world to the work. He manages to convey a feeling that you are watching something with a sacred quality to it and then one short narrative emerges. In an interview sequence with Noriko Okawa she talks about the last few months in the life of her son Makoto before his death by cancer – and the value his ‘makoot’ dolls and colourful drawings brought to everyone around him. The myth of the unicorn emerges from the mists of time. The unicorn known in Japan and other East Asian cultures as a ‘Kirin’ or ‘Qilin’ is a mythical, hooved, chimerical creature said to appear with the imminent arrival or passing of a sage or illustrious ruler. As such it is an omen of serenity. With The Voice of the Unicorn Butchins has successfully conveyed the process of making art as a defining act for those artists in this particular institution. It is as if the space itself within Corners has been elevated to a state of grace where creativity is the only thing that makes sense in the world – and what it brings is peace and a certain freedom from imposed meaning in nonsensical and hierarchical ways that is the general state in which society operates.